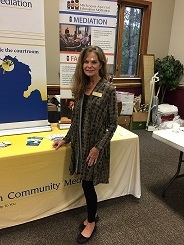 The 2018 Information Summit was held from 8:00am to noon on Friday, September 28 at the Petoskey United Methodist Church. Information Summit is an opportunity for staff from non-profit and governmental sectors, along with advocates who serve children, adults and families to network. The event’s primary goal is to provide local health and human services staff with up-to-date information on the region’s wide array of local programs and available services. The keynote speaker for 2018 was The Honorable Valerie Snyder, who spoke about the evolution of probate court, going all the way back to its origins in England. The September date for the 2019 Information Summit has yet to be announced.